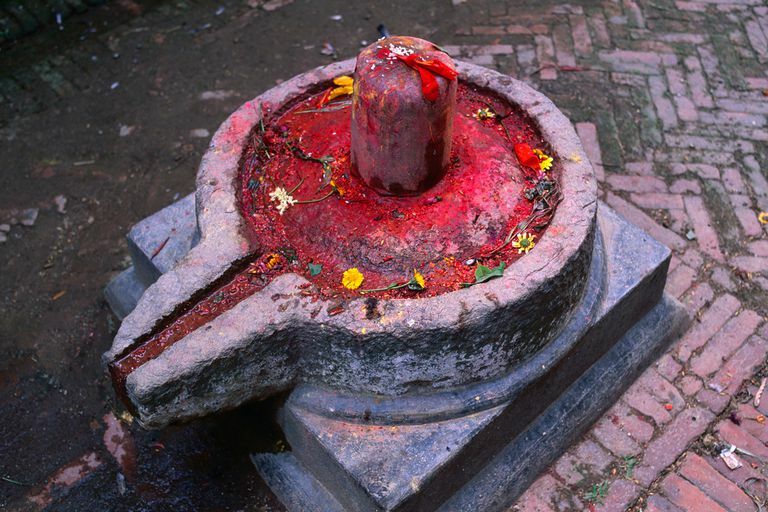 The Shiva Linga or Lingam is a symbol that represents Lord Shiva in Hinduism. As the most powerful of deities, temples are built in his honor that includes a Shiva Linga, representing all the energies of the world and beyond. In addition to the Hindu tradition, the Shiva Linga has been adopted by a number of metaphysical disciplines. In this case, it refers to a particular stone from an Indian river that is believed to have healing powers for the mind, body, and soul. To understand these dual uses for the words Shiva Linga, let's approach them one at a time and begin with the origin. 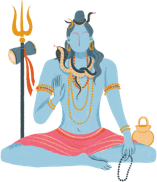 They are completely different but connected in their underlying meaning and connection to Lord Shiva. In Sanskrit, Linga means a "mark" or a symbol, which points to an inference. Thus the Shiva Linga is a symbol of Lord Shiva: a mark that reminds of the Omnipotent Lord, which is formless. Shiva Linga speaks to the Hindu devotee in the unmistakable language of silence. It is only the outward symbol of the formless being, Lord Shiva, who is the undying soul seated in the chambers of your heart. He is your in-dweller, your innermost self or Atman, and he is also identical with the supreme Brahman. The ancient Hindu scripture "Linga Purana" says that the foremost Linga is devoid of smell, color, taste, etc., and is spoken of as Prakriti, or Nature itself. In the post-Vedic period, the Linga became symbolical of the generative power of Lord Shiva. The Linga is like an egg and represents the Brahmanda (the cosmic egg). Linga signifies that the creation is affected by the union of Prakriti and Purusha, the male and the female powers of Nature. It also signifies Satya, Jnana, and Ananta—Truth, Knowledge, and Infinity. What Does a Hindu Shiva Linga Look Like? A Shiva Linga consists of three parts. The lowest of these is called the Brahma-Pitha; the middle one, the Vishnu-Pitha; the uppermost one, the Shiva-Pitha. These are associated with the Hindu pantheon of gods: Brahma (the Creator), Vishnu (the Preserver), and Shiva (the Destroyer). The typically circular base or peetham (Brahma-Pitha) holds an elongated bowl-like structure (Vishnu-Pitha) reminiscent of a flat teapot with a spout that has had the top cut off. Within the bowl rests a tall cylinder with a rounded head (Shiva-Pitha). It is in this portion of the Shiva Linga that many people see a phallus. The Shiva Linga is most often carved from stone. In Shiva Temples, they can be quite large, towering over devotees, though Lingum can also be small, close to knee-height. Many are adorned with traditional symbols or elaborate carvings, though some are somewhat industrial looking or relatively plain and simple. Of all the Shiva Lingas in India, a few stand out as holding the most importance. The temple of Lord Mahalinga at Tiruvidaimarudur, known also as Madhyarjuna, is regarded as the great Shiva temple of South India. There are 12 Jyotir-lingas and five Pancha-bhuta Lingas in India. The Sphatika-linga is made of quartz. It is prescribed for the deepest kind of worship of Lord Shiva. It has no color of its own but takes on the color of the substance which it comes in contact with. It represents the Nirguna Brahman, the attribute-less Supreme Self or the formless Shiva. There is a mysterious or indescribable power (or Shakti) in the Linga. It is believed to induce concentration of the mind and help focus one's attention. That is why the ancient sages and seers of India prescribed Linga to be installed in the temples of Lord Shiva. For a sincere devotee, the Linga is not merely a block of stone, it is all-radiant. It talks to him, raises him above body-consciousness, and helps him communicate with the Lord. Lord Rama worshiped the Shiva Linga at Rameshwaram. Ravana, the learned scholar, worshiped the golden Linga for its mystical powers. Taking from these Hindu beliefs, the Shiva Lingam referenced by metaphysical disciplines refer to a specific stone. It is used as a healing stone, particularly for sexual fertility and potency as well as overall well-being, power, and energy. Practitioners in healing crystals and rocks believe the Shiva Lingam to be among the most powerful. It is said to bring balance and harmony to those who carry it and have great healing energy for all seven chakras. Physically, the Shiva Linga in this context is quite different from that of Hindu tradition. It is an egg-shaped stone of brown shades that is gathered from the Narmada River in the sacred Mardhata mountains. Polished to a high sheen, locals sell these stones to spiritual seekers all over the world. They can vary in size from one-half an inch in length to several feet. The markings are said to represent those found on the Lord Shiva's forehead. Those who use the Shiva Lingam see in it a symbol of fertility: the phallus representing the male and the egg the female. Together, they represent the fundamental creation of life and of Nature itself as well as a fundamental spiritual balance. The Lingam stones are used in meditation, carried with the person throughout the day, or used in healing ceremonies and rituals.